To give more time for students around SEPnet to form teams, we are extending the time for them to register for the Enterprising Ideas competition. We’d also like to dispel some misconceptions about what the programme is about and Elaine Hickmott, who is organising the programme for GRADnet, has written an article articulating the goals and purpose of what the training involves and how it helps Physics students in their future careers. 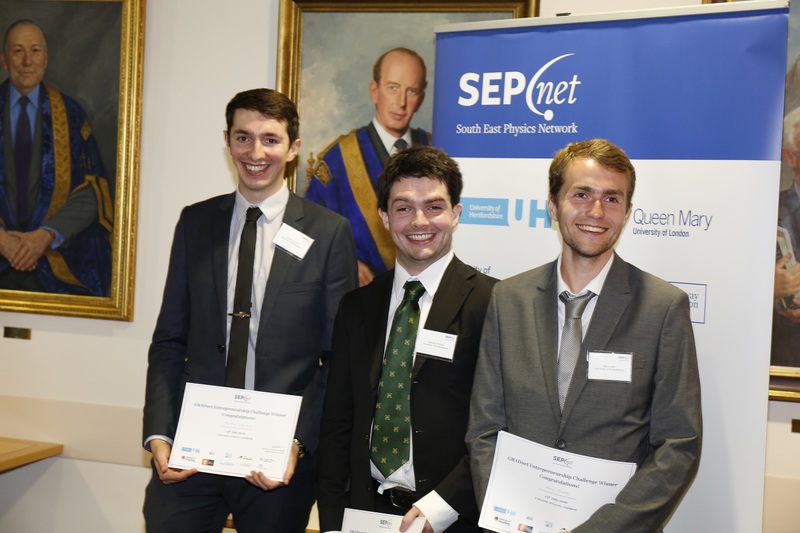 Which SEPnet university team has the greatest entrepreneurial spirit? The 2017 GRADnet Enterprising Ideas Competition is now open! Are you interested in developing your entrepreneurial skills? Put forward a team for a chance to win £100 for each member! SEPnet is organising its 2nd annual enterprising ideas competition to help you develop your entrepreneurship skills. SEPnet PGRs and physics undergraduates in their penultimate year are invited to put forward teams to compete to be the most entrepreneurial in SEPnet. Business and research increasingly need graduates who bring fresh ideas, innovative thinking and who have great team working skills. Physicists have the research skills and technical knowledge to inform policy, improve society and create exciting new products. Highly developed entrepreneurial skills and an enquiring mind are key to building a knowledge-based economy and can give you the edge when applying for research or graduate jobs or studentships. participate in multiple activities based on real life experiences and scenarios. The programme is NOT about turning you into entrepreneurs or seeking new business opportunities but to expose you to the world of business and the impact of innovation on business. You do not need to have a business idea or experience beforehand to take part! If you are a PGR or an undergraduate you will need to confirm your interest in participating by 31 March 2017. Places are limited on a first come, first served basis. designated member(s) of the team will attend two days of FREE residential training on 28 and 29 June which will contribute to professional development and build skills to help with the challenge. Training will include varied insights into entrepreneurship; what it really means and why it is important, team work and idea generation together with business, enterprise and communication skills. Teams will be required to produce and submit an initial short video by end of September outlining your idea. Teams will be introduced to local entrepreneurial experts at your university to support development of your idea. Ongoing entrepreneurship materials giving hints and tips will also be provided. Teams will receive feedback from a variety of experts and tips on how take your idea forward.